We need research to understand and fight disease. But research is often limited by access to patients and availability of diseased tissues to study. 'Disease models' can help overcome these problems by enabling scientists to examine diseases in the lab. Stem cells, including reprogrammed or 'iPS' cells, are a new source of cells that can be used as models for diseases which are otherwise difficult to explore. Researchers make iPSCs by ‘reprogramming’ specialised adult cells, such as skin cells. The iPSCs can then be used to make any type of cell found in the body, such as heart or brain cells. Because iPSCs have the same genes and mutations as the patient they come from, researchers can use iPSCs to recreate diseases in the lab and study how a patient’s genetics contribute to their disease. iPSCs allow researchers to observe and study ‘cell differentiation’, the process of cells becoming specialised, and what can go wrong during differentiation to cause different diseases. Many diseases are now being studied using iPSC model systems, spanning from neurological diseases, such as amyotrophic lateral sclerosis (ALS), to blood and immunodeficiency conditions. iPSCs are being used to create diseased cells for testing new drugs and treatments in the lab. Researchers are using iPSCs to ‘turn back the clock’ on patients’ cells and watch how healthy cells become diseased. iPSCs also let researchers examine how patients’ genes, mutations and environmental conditions might impact disease progression. Researchers are still learning about iPSCs. In theory, iPSCs can make any cell in the body, but researchers must first learn how to direct them to do this. Although iPSCs provide researchers with cells that contain the genes and mutations associated with a disease, it does not mean specialised cells created from these iPSCs will behave in the lab the way diseased cells in the body behave. Modelling complex diseases (e.g. those caused by problems occurring between cells that make up complex structures, tissues and organs) with iPSCs is currently not possible but may be in the distant future. What is disease modelling and why do we need it? How can stem cells help with disease modelling? Human diseases are many and varied; some cost lives, others are only a minor inconvenience. Whether or not a disease can be treated often depends on whether we can gain a good understanding of its basic biology. Without research to uncover how a disease works, it is difficult to advance treatments. Disease modelling allows scientists to explore how a disease works in the laboratory, rather than directly in a patient. A disease model is a representation of the abnormal human or animal biology that occurs in a particular disease. The model may be a mouse with a condition that mimics a human disease, or it could be cells in a dish. Whatever the model, it must reproduce aspects of a disease, or even the whole disease pathology (all the physical effects of the disease), outside the human body. Models make closer, more extensive scientific investigation of diseases possible. They also allow experiments to be repeated many times, which is absolutely necessary for results to be considered trustworthy. Biological systems like our bodies are very complex and our understanding of them is still quite limited. This often leads to very variable outcomes in experiments because the results can be affected by many things we do not yet understand or cannot control. Researchers need to repeat an experiment many times to determine a clear answer. The better they understand the disease, the more they can simplify their experiments to provide answers to specific questions. One way to simplify the complicated situation in a disease is to analyse individual cells or groups of cells, rather than looking at complex tissues or the whole body. Animal models, such as mice, are widely used in research as they have been studied for many years and can develop symptoms similar to human disease symptoms. However, animals can never fully mirror all aspects of human biology or disease. Treatments that have been developed and found to be effective in experimental animal models can give vital clues and information, but do not always work when transferred to human patients. Animal experimentation also has other limitations: ethical implications mean the use of animals in research must be minimised, and animal models are also expensive and time consuming to create and use. Disease models based on human cells can help tackle these problems. In particular, using cells avoids the difficulty of differences between animals and humans because scientists can study human cells. Human cells were first cultured in the laboratory in the 19th century. Since then, our understanding of cells has improved greatly and technological advances have made it easier to keep human cells alive and free from contamination outside the protection of the body. Research on cancer cells contributed significantly to this progress because cancer cells can grow for a prolonged and even indefinite period of time if given the right nutrients. Healthy cells have a limited lifespan and are much more difficult to maintain and multiply in a dish. They can also be tricky to get hold of. While some cells, such as skin cells or blood cells, can be taken from a patient relatively easily, others are far more difficult or even impossible to obtain for research. For example, human brain cells are difficult to extract without major surgery and yet they are needed to study a large number of neurodegenerative diseases. Certain types of stem cells may offer a solution. Stem cells can both self-renew (copy themselves) and differentiate (change) into more specialised cells. One particular type of stem cell offers a powerful tool for disease modelling: induced pluripotent stem cells, or iPS cells. These lab-grown stem cells are made by ‘reprogramming’ specialised cells such as skin cells. The resulting iPS cells can produce all the different types of cells in the body. This means they can act as a source of cells that are otherwise difficult to obtain, such as brain cells. Scientists are working on methods for directing iPS cells to make a specific type of cell on demand. Embryonic stem cells, obtained from early stage embryos, also have the ability to make all the different cells of the body. 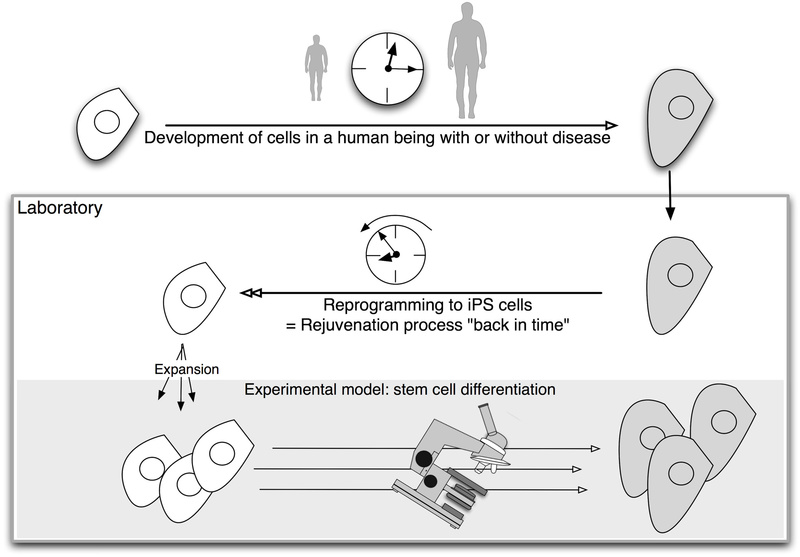 However, iPS cells have a unique advantage for disease modelling: they can be made by reprogramming a patient’s own skin cells to make patient-specific cells in the laboratory. If the disease has a genetic cause, the lab-grown cells will carry that genetic flaw. And iPS cells have another advantage. Diseases are often detected when symptoms appear, which may be long after the disease process began in the body. This makes it almost impossible to analyse the onset of diseases without looking back in time. Reprogramming technology acts like a time machine, taking mature cells like skin cells and returning them to their earlier embryonic state. These embryonic-like iPS cells could then be used to make any cells the researcher wants to study, from early to late stages of cell development. This gives scientists a tool to model events in the diseased human body. Cells made in this way are therefore called iPS cell disease models. Disease modelling with iPS cells: Skin cells from a patient can be reprogrammed to behave like embryonic stem cells. Scientists can then monitor their development to model what happens in the diseased human body. In the last few years iPS cells have been created from patients with a number of different diseases. One example of the use of iPS cells in disease modeling is in research on the currently incurable disease, spinal muscular atrophy (SMA). SMA patients have a specific defect in one gene, called SMN1. This genetic fault affects nerve cells in the spinal cord, resulting in muscle weakness, severe disability and shortened life in children. While the affected nerve cells are very difficult to obtain from donors, it is possible to create them from iPS cells. SMA-iPS cells without a working SMN1 gene have been created and are being used to model and study the onset of the disease in newly developing nerve cells. Once the diseased characteristics of the cells are identified, scientists can perform drug screens to look for drugs that correct the disease. Hence, SMA-iPS cells could allow new treatments to be developed without the need to carry out tests directly on patients in the early stages of research. In addition to (SMA), some of the diseases that have been studied in detail with iPS cells are amyotrophic lateral sclerosis, Alzheimer’s disease, ataxia telangiectasia, Down syndrome, familial dysautonomia, fragile X syndrome, Friedrich ataxia, Huntington’s disease, Niemann-Pick disease, Parkinson’s disease and schizophrenia. Disease models using iPS cells are also under development for many other neurological, blood-related, metabolic, cardiovascular, immunodeficiency and other conditions. The number of diseases studied in this way is increasing all the time. A notable example of how an iPS cell-based model was used to study a disease and discover a potential cure is a recent set of studies on amyotrophic lateral sclerosis (ALS). ALS or Lou Gehrig’s disease is a fatal disease that results in muscle wasting and paralysis due to the loss of nerve cells in the spinal cord. Mutations in the gene SUPEROXIDE DISMUTASE 1 (SOD1) cause about a quarter of hereditary cases of ALS. There is currently no cure for this devastating disease and the only drug available to ALS patients is Riluzole, which merely delays the onset of some of the aspects of the disease. The discovery of new drugs for ALS has been hampered by the lack of suitable models for preclinical testing of potential medicines. For example, the current rodent models of ALS do not entirely mimic the human disease phenotype. Recently, researchers have created iPS cells from ALS patients and then used the iPS cells to further produce the ALS nerve cells. These nerve cells displayed ALS disease characteristics and were then used to look for drugs that could ameliorate the disease. One such drug, ezogabine, is currently being tested in clinical trials. The hope is that the clinical trial will be a success that could bring cure to ALS patients. Nonetheless, even if the trial fails, the researchers still have a valuable model to further study the disease and test out new potential drugs. iPS cells have been widely adopted for disease modelling, but they also bring with them a number of complexities and they may not be the answer to all research questions. A new type of stem cell – iPS cells are a completely new, lab-made type of stem cell. More research is needed to understand the reprogramming process and its effects on the cells, and to evaluate potential uses and risks. Recreating a disease is complex – disease modelling aims to use iPS cells to recreate features of a disease outside the patient by generating cells with the patient’s genetic code. However, this does not always result in cells that have the characteristics of the disease. Although diseases are often fully or partially caused by errors in our DNA code, other biological processes also affect or initiate many diseases. Some of these DNA-independent disease processes cannot be easily controlled or mirrored with the current iPS cell technology. However, iPS cell disease modelling can help researchers to dissect how much of a disease is caused by DNA changes. Modelling different types of diseases - although iPS cells can theoretically be used to model any disease, they are more suitable for modelling diseases caused by mutations in a single gene (monogenic diseases) than for modelling diseases caused by alterations of several genes (polygenic or complex diseases) or diseases caused by environmental factors. Diseases often affect many types of cells – iPS cell disease models allow researchers to study how specific types of cells are affected by a disease. However, diseases usually affect complex tissues or organs containing several different kinds of cells in many interacting layers. The interaction between different cells is often at least partially responsible for the effects of a disease. Researchers are starting to build much more complex structures to model these aspects of diseases more completely. One approach is to use stem cells to grow groups of cells in 3D structures that resemble the tissue of different organs. Growing and using these ‘organoids’ is still in the early stages and requires advanced 3D differentiation technologies. However, once these methods are established organoids might be used as more complex disease models than what flat (2D) cell culture models offer. iPS cells give researchers the opportunity to study previously inaccessible human cells, such as the nerve cells of the brain. Their use in disease models provides a new stepping-stone towards a better understanding of how many diseases work. A great deal of research using iPS cells is already underway and researchers expect that iPS cell disease models will provide valuable clues for the development of new medicines or other clinical treatments. This factsheet was created by Christian Unger. Reviewed and updated in 2013 by Peter Andrews. Reviewed and updated in 2016 by Ivana Barbaric. Reviewed and updated in 2018 by Paul Gokhale. Lead image created by Emma Kemp using Servier Medical Art. Photograph of pills by MorgueFile. Other images by Christian Unger (UV light photograph initially created as part of the Smile of a stem cell exhibit by ESTOOLS. The first iPS cells were made in 2006. By January 2012, 46 published studies had produced disease-specific iPS cells. Disease modelling can be used to help search for and test new drugs. These are human induced pluripotent stem (iPS) cells grown in the lab.